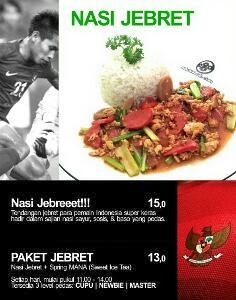 SEA GAMES is coming and we have new menus to supports GARUDA Team, we have Nasi Jebret which has 3 spicy levels: cupu, newbie, and master. 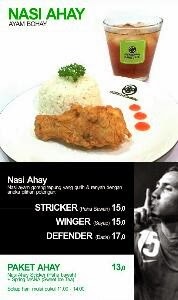 We also have Nasi Ahay "Ayam Bohay" which available with striker, winger, and defender. You also can get this menus with less pricing on our lunch hours, start 11-14 u can get Paket Jebret only IDR13k and Paket Ahay gor IDR15k only, all includes with FREE DRINKS! Enjoy our new menus!